is an effort to help you in shopping for quality fire agate rough. It will attempt to answer some common questions and assist you in what to look for in buying fire agate rough for lapidary cabbing, fire agate gemstone carving, or buying fire agate rough for mineral display purposes. online is a very challanging task, always be sure you know what you are purchasing and who you are purchasing from. We hope to help explain what you may encounter when looking to purchase fire agate material and help you in making an informed decision on your fire agate purchases. should actually contain a real fire layer. Often substandard forms of fire agate are sold on the internet, but these would actually be better descibed as just plain or colored chalcedony, banded agate, carnelian agate, or normal agate. 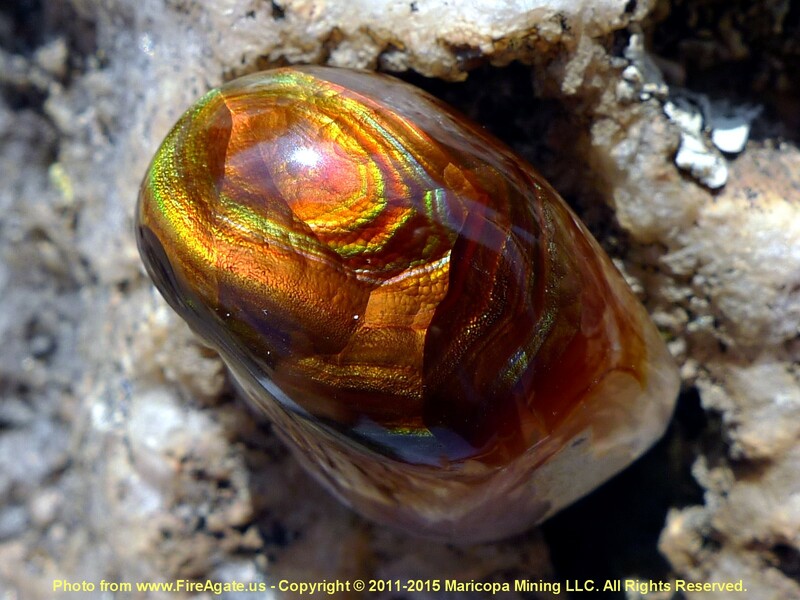 Some are very similar to true fire agate, but the limonite and geothite fire layers that makes the iridescent rainbow fire agate gemstone is missing. Someone very familiar with fire agate rough can usually tell if a piece of rough actually contains the proper fire layer, or at least has a good possibility of containing one due to the structure, coloration and origin of the stone. It may be difficult to ascertain the final colors and/or quality of the final cut gem from a piece of rough but an experienced fire agate seller should at least be able to say that there is a good possibility of getting true fire out of a piece of rough. If you purchase large quantities of fire agate rough then you will likely by dealing with 5 gallon buckets of gemstone material. 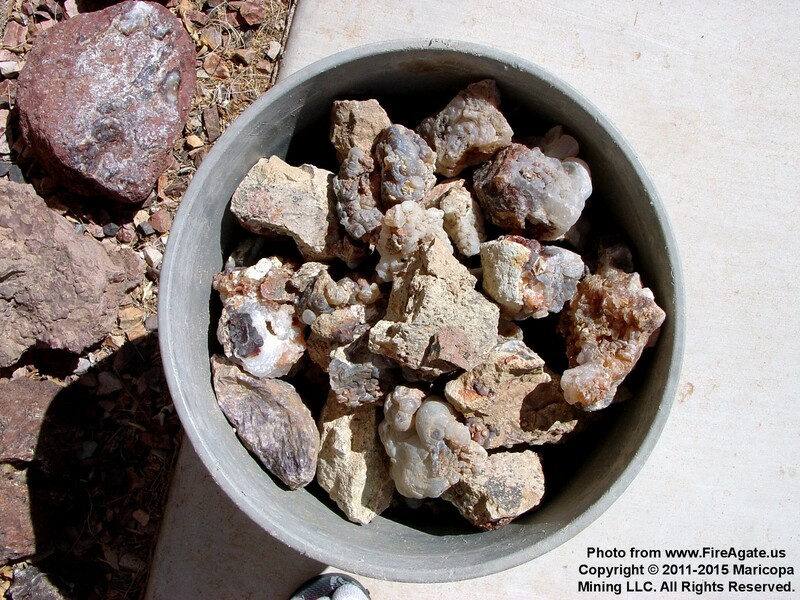 These buckets usually contain between 40-50 pounds, or about 20-25 kilos, of fire agate gemstone rough. 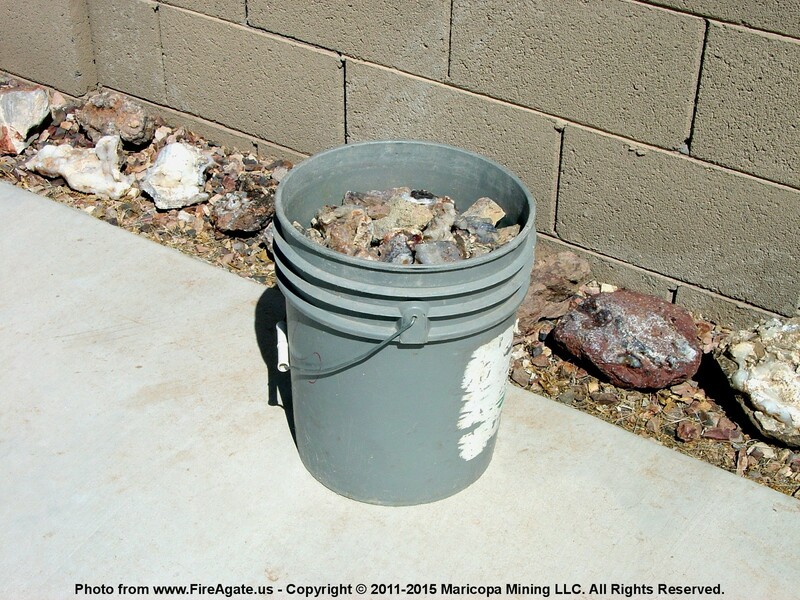 Sometimes referred to as mine run fire agate rough, these 5 gallon buckets are just handy storage containers used by the fire agate miners during mining operations. They are convenient to transport and hold a fairly substantial amount of material that is easy to handle and transport. The overall quality of this type of fire agate material depends upon many factors including which fire agate mine it came from, where in the mine it came from, and who mined the material and thier related experience with mining fire agate. Obtaining rough of in this style and quantity in one of the best economical ways to get fire agate rough. Be aware that when purchasing this type of bulk material that prices can vary in a wide price ranging from a few hundred dollars to several thousand dollars per bucket depending upon many factors, mostly the quality of the fire agate rough. Any good fire agate distributor should be able to give you a good idea of the quality of the material. With very few exceptions there is no such thing as 'unsearched' fire agate rough, most material has typically been closely examined before reaching the retail market. Most fire agate miners won't miss a high grade stone in the mining process (would you toss a $1000+ gem in a bucket to get broken? ), they stand out from the norm and are usually set aside either during the mining process or during the cleanup wash process prior to retail sale. It is also quite possible that these 5 gallon buckets of material will also have a second searching process done by the wholesale distributor of the fire agate rough, who often selects choice pieces for thier own carving needs or other select clientele. 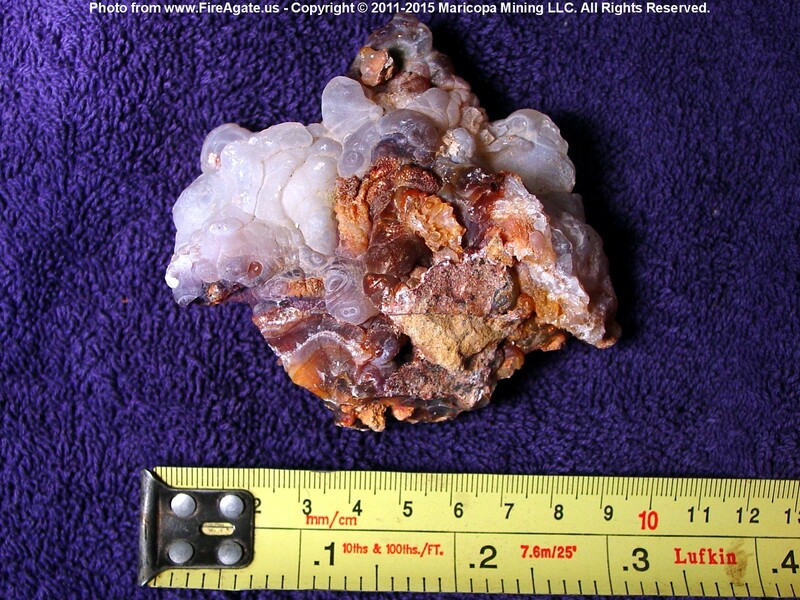 Shown here is a piece of fire agate rough, which is a typical example of fire agate material. 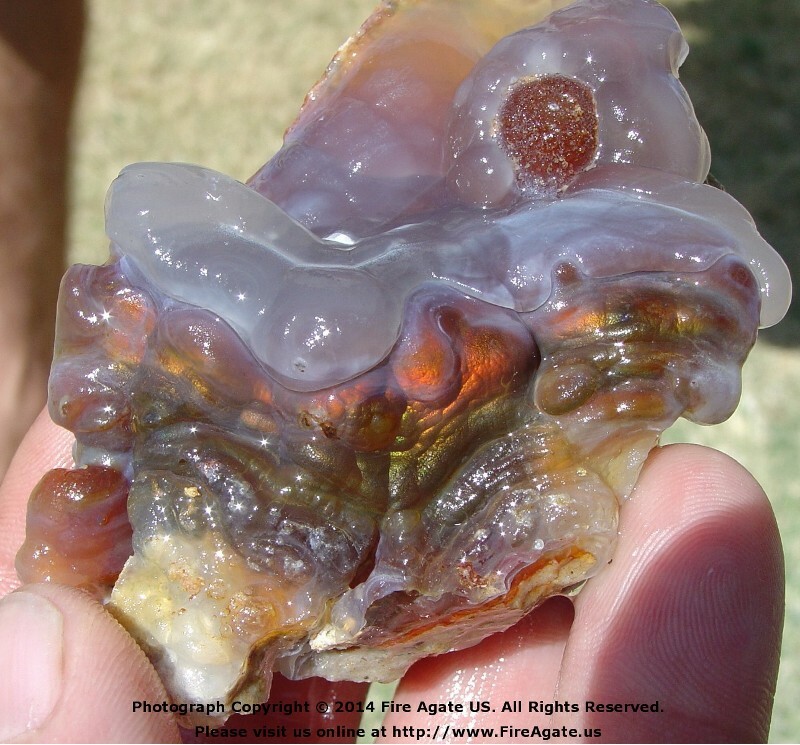 Always look for the botryoidal (grape-like) chalcedony bubble structure in fire agate rough. Fire agates were formed In the Tertiary geological period when hot water, saturated with silica and iron oxide, repeatedly filled cracks and voids in the surrounding rock. This repeated coating formed the fire agate's botryoidal structure. While 'fire' may not be directly visible in fire agate rough, there should still be the proper brownish and rust colored idicators present that are the thin limonite and/or geothite iron oxide layers which make up the fire layers. These mixed silica and iron oxide layers are the most important thing to look for in fire agate rough, without them there will be no fire. The thicker the layers, or banding, the better chance of having multiple colored layers stacked upon themselves when it comes time to cut the gemstone. Shown here is the back side of the same piece of fire agate rough as shown above. Fire agate rough will often have large portions of plain chalcedony, quartz, and/or rhyolite host rock (matrix) still attached to the stone, making it's weight quite heavy in relationship to the fire agate gem contained within the stone. All of this excess material will need to be removed with a rock trim saw and/or wheel grinder prior to getting down to the actual gemstone carving. This is usually a very time consuming practice and if done improperly it can ruin a good gemstone by accidentally cutting into the fire layers. Consider both the weight and time involved in removing this excess material when buying rough. Shipping 'useless' rock material around the world can be very expensive. 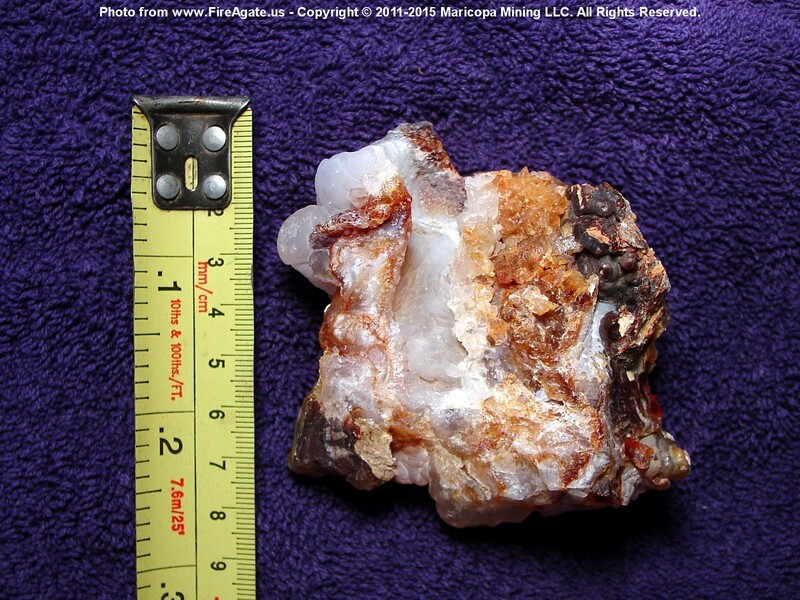 This particular piece of rough weighs close to a half pound (0.25 kilograms), but after the excess rock is removed it will be considerably smaller and weigh much less. Windowed fire agate rough has had much of the excess chalcedony, quartz and rhyolite host rock (matrix) removed and the fire exposed for viewing purposes. This cleanup and exposure of the fire will vary from only a small view into the stone to a full exposure and polishing to give the best view possible. If you are new to fire agates then buying a piece of windowed fire agate rough may be a good choice since you are able to see what type of fire you will encounter. Buying windowed rough will save substantial time and effort during the carving process and also save money on shipping costs since much of the excess rock is removed. Most fire agate carvers have many fire agate windows available since it is often a normal step in the overall fire agate gemstone carving process and many will sell off the lower quality windows at very reasonable prices. Look carefully at a stone for flaws such as over cutting into the fire bands and cracks which will severly impact the final quality of a cut gem. High grade fire agate rough is the most desirable and also the most expensive fire agate rough available. Often the brilliant fire layers on this type of rough are near the surface of the stone which makes for a much easier gemstone cutting process, although care has to be taken not to damage the fire layer. Supplies of high grade fire agate rough is very limited with most of it being set aside by the miners for preferred clientele. Due to the scarcity of this material most fire agate miners or experienced fire agate carvers will not part with the rough except for a premium price which closely reflects of value of the likely final cut gem. Prices on this style of rough are usually on a piece by piece basis depending upon the overall quality and properties of the gemstone. Best wishes and happy Fire Agate Carving!